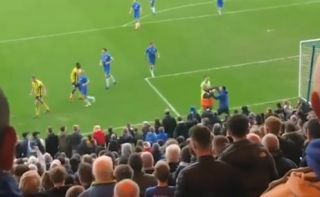 Football fans endangering the safety of players seems to be an issue once again as Stockport fans stormed the pitch with attempted attacks on Fylde players. The Sun has photos of the incident that took place in the semi-final of the FA trophy, while they also report that a fan even managed to get into the Fylde dressing room after the game. This comes not long after Aston Villa star Jack Grealish was punched by a Birmingham City fan who somehow got onto the pitch in the recent game at St Andrew’s. It’s a very worrying trend, and as the images above and below show, it really could be only a matter of time before someone gets seriously hurt.